One of my goals for the New Year, especially now that I have more time on my hands, is to not only make more meals at home, but to make a lot more unique, tasty and healthy meals at home. The New Year is a great time to hit the reset button. It’s a New Year, New You! Lunch is one of the meals that tends to get a little boring. I usually make turkey or tuna sandwiches because they’re easy… however, they get old fast. But a tuna sandwich doesn’t have to be just tuna and mayo! 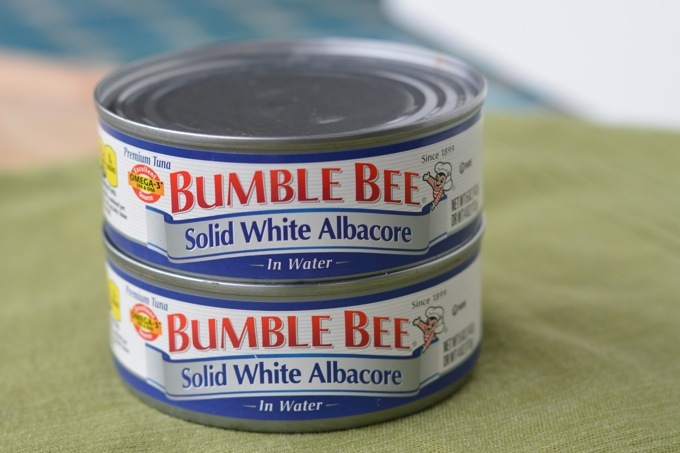 Bumble Bee® tuna can be so much more than that. Plus, it’s a great option for healthy eating. Available in can or pouch, each Bumble Bee® product is an easy and delicious way to add a variety of nutrients to your diet, including lean protein, healthy fat, and important vitamins and minerals. Fish is such a superfood, but sometimes it’s a pain to cook– canned tuna is so easy, it’s the perfect way to get your omega-3’s! In this tuna salad, I swapped out mayo for a creamy combo of Greek yogurt (tons of protein), olive oil (healthy fats!) and a wee bit of feta cheese (so much flavor). Then I mixed in some classic Greek flavors– cucumber, tomato, oregano and Kalamata olives. I decided to use solid white albacore because I thought the meatier texture would hold up well to the veggies… you could definitely use any kind of tuna, though. There are so many awesome flavors in here, you’ll never miss the mayo! And you definitely won’t think tuna salads are boring after tasting this one! I stuffed my tuna salad in a whole wheat wrap, but this would also be delicious on crackers, or even on cucumber slices for an even healthier meal. I loved having a healthy and tasty meal to break up the day during my first week of work-at-home/housewife adventures. This meal would travel well, too, so I’ll definitely be packing my leftovers into Nick’s lunch. And I’m sure I’ll be making this again. I’m already craving it! In a small bowl, whisk together yogurt, lemon juice and olive oil. Stir in oregano and feta cheese. 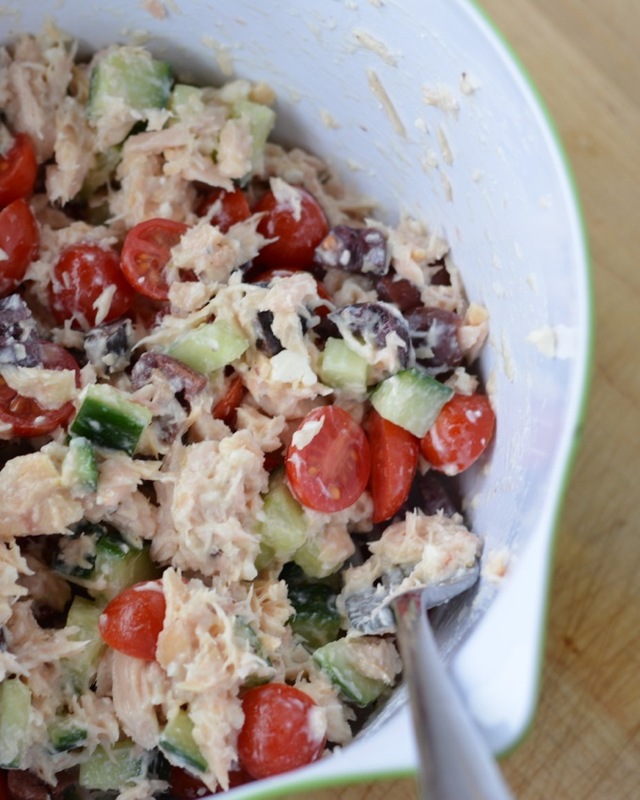 In another bowl, toss together tuna, olives, cucumber and tomatoes. Pour in yogurt mixture and toss gently until combined. Season with salt and pepper. Serve tuna salad in whole wheat wraps! What other healthy lunches are you making for the New Year? How do you snazz up or healthify your tuna salad? 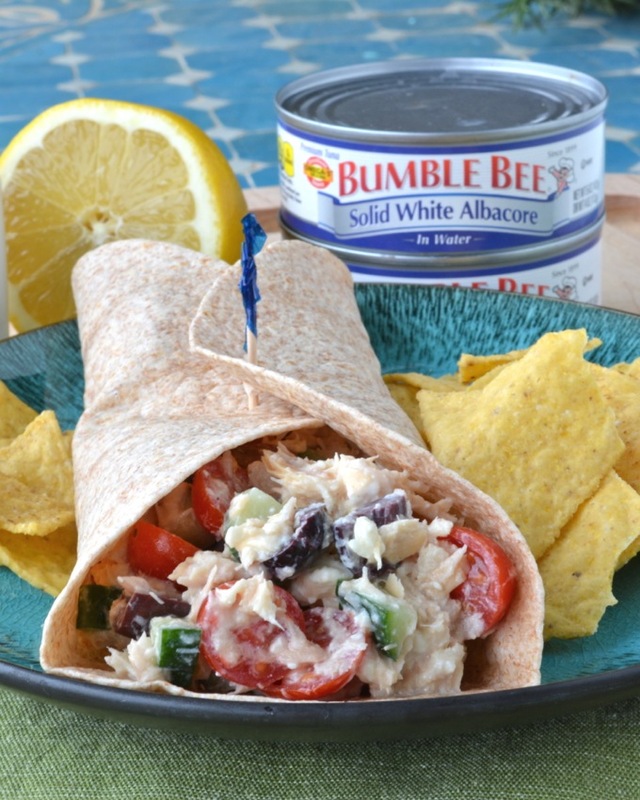 What are your favorite Bumble Bee® tuna recipes?! These wraps look just like what I’d enjoy for lunch! I always use Greek yogurt instead of mayo in my tuna, and the Greek flavors in this look amazing! The wrap makes these more fun and less boring than a tuna sandwich on bread. Pinned! Greek yogurt is the best! So versatile for replacing so many other creamy things! Now this would make a delicious and healthy lunch! My lunch today is so boring: left over roasted chicken and an apple! Blah! Wish I had this instead. And really pretty pictures Jess! These wraps look fantastic, Jessica! I love tuna but haven’t tried it in a wrap before. I definitely need to change that! I love the combination of feta and olives in here. Sounds delish! I always looking for new ways to spruce up lunch, and wham-BAM! You did it for me with these gorgeous wraps! 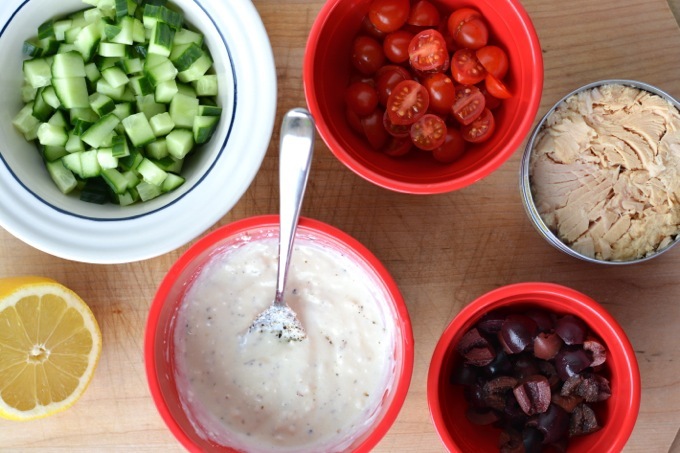 I absolutely love the idea of combining greek salad with tuna salad! Oh I really like this idea!! I love anything that is quick, easy, and healthy! I made this for dinner tonight. It is so good, it will be my go to salad.